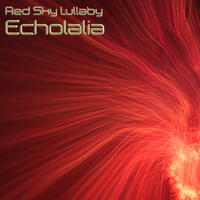 Red Sky Lullaby : Echolalia. Echolalia is a laid back mix of electronic and acoustic elements. Piano, double bass and orchestral sounds blend with hip hop beats, dub basslines, glitched out samples and analog synths to take you on a chilled melodic journey.